Wow. I can't believe today is July 31st. Where has the month/summer gone?? Between work and the weather, July was definitely a month of non-accomplishments. I finished a modified Reyna shawl but it's still laying in a heap on the corner of my desk waiting to be blocked. And if I'm honest, it's also waiting to have it's loose ends woven in. I started another pair of Outlander inspired gloves but I haven't taken a single photo of them, nor knit a single stitch on them since the first week of July. I did start and finish the Great White Thing. I haven't photographed the final 'thing' yet because it's been too humid. It's so humid that the interior of our house is dark and dreary like a super rainy day and the outside is just too damp. I tried, for all of five minutes, to take outdoor photos recently but due to the heat and humidity, my sweat was dripping on the camera lens. Eew! One day soon I'll get photos taken and I'll also get Great White put into the mail (it's a gift) then I can give you some details. I've started Twisted three times. Hopefully, as they say, the third time's the charm. 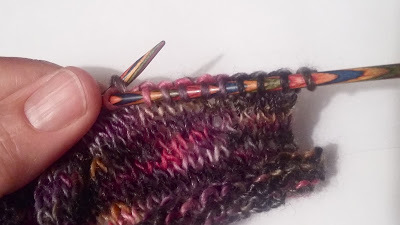 It started out on Knit Pick's Options needles but look how close the yarn color is to the needle color. Even though Twisted is all stockinette, I couldn't deal with the lack of contrast between yarn & needle. I also realized that, although I'd done a gauge swatch (for once!) I wasn't getting close to gauge. I frogged it and started over on larger needles. Four inches of re-knit Twisted and.... Yep, you guessed it. Still not getting gauge. I had to go up 4 needle sizes from the needles I'd swatched with. This is why I rarely bother with swatching. Anyway, Twisted is back on track and I'm five or six inches into it. But still no photos. Have I mentioned the heat and humidity and sweat on the camera lens issues? 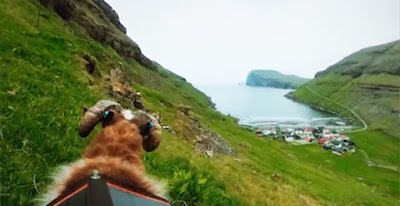 So that I don't leave you hanging with thoughts of my sweat, here's a #SheepWithAView photo. 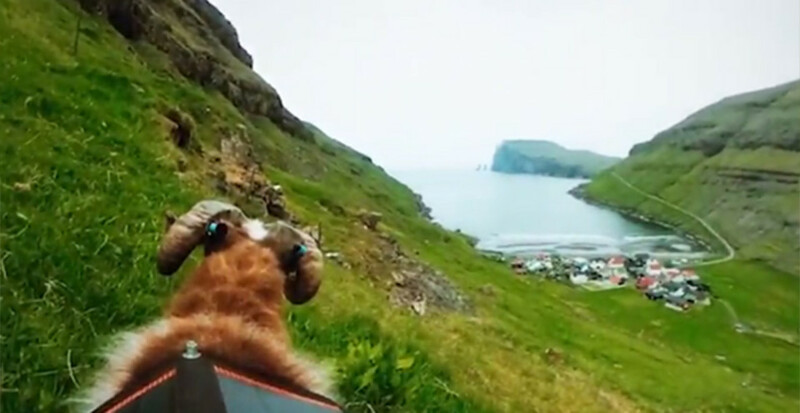 I'm in love with #SheepWithAView. I'm in trouble now! I'm going to need a second job. Maybe a third, fourth, even a fifth job. I found a new LYS. I guess it qualifies as a local yarn shop. It's a little further away than what what most people would consider local. It takes about 50 minutes to get there but really, from our house in the boondocks, it takes about 50 minutes to get anywhere. I'm calling it local. I have an LYS! 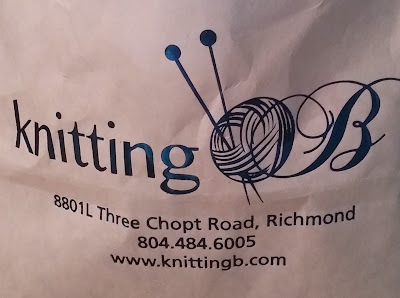 I wasn't expecting much when I stepped into Knitting B's this past Saturday. The online reviews were not plentiful and seemed to be mostly from someone who posted repeatedly about the shop being small & their irritation about it closing at 4 p.m. each day. Considering my last LYS (which closed it's doors a few years ago) was only open a few random hours, four days a week and thought nothing of hanging a 'closed' sign on the door whenever the shop owner's child had any kind of sports activity or school function going on... I consider closing at 4 p.m. seven days a week to be pretty sweet. Anyway.... I'm going to need another job. Knitting B is not small. It's not huge, but it's not what I'd call small. And it's fully stocked. A little too well stocked for my budget, actually. I entered the shop looking for something to knit another Pi shawl with. I've had the urge to knit a gray tonal Pi shawl for a while now. I walked out with everything but gray tonal yarn. I was immediately drawn to this Louisa Harding Pittura. At first glance, I noticed the reds and oranges and since it's been 99 degrees and about 4,000% humidity lately, I have a massive case of fall fever. As I carried the future cowl around the store, I began noticing the blues & lilacs also in the skein. It's summery too! 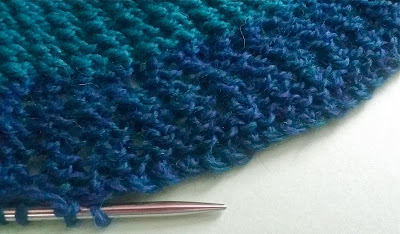 I can knit a cowl (or maybe a shawl) that I can wear in the fall when the temperature begins to dip and when I'm jonesing for the warmth of summer. If you're interested, the yarn is color #9071. Next, I spied the Regia display. 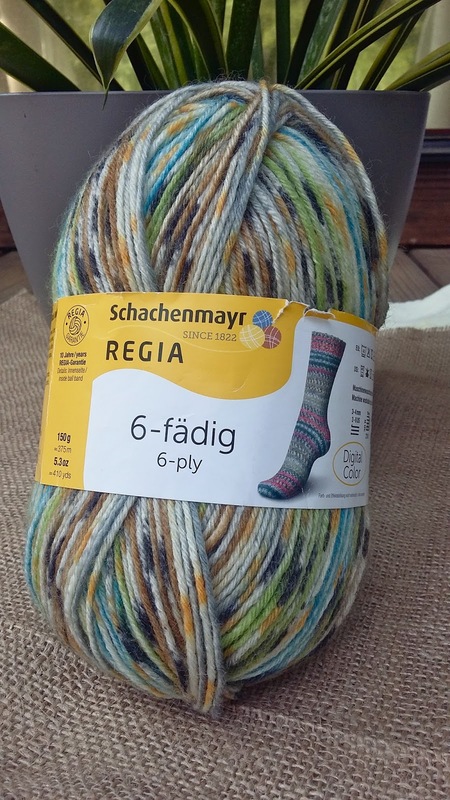 This Regia 6-fadig 6 ply reminds me of Online sock yarn which I love. I grabbed this skein which reminds me of a rocky woodland stream and I can't wait to cast on for a sock. 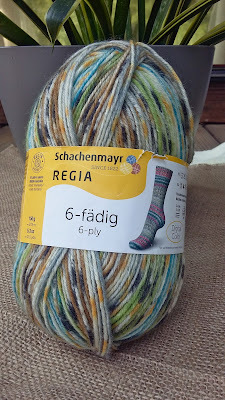 I've knit socks with Regia many times but never with 6-fadig. Next, I noticed a knitted top that I just had to have. 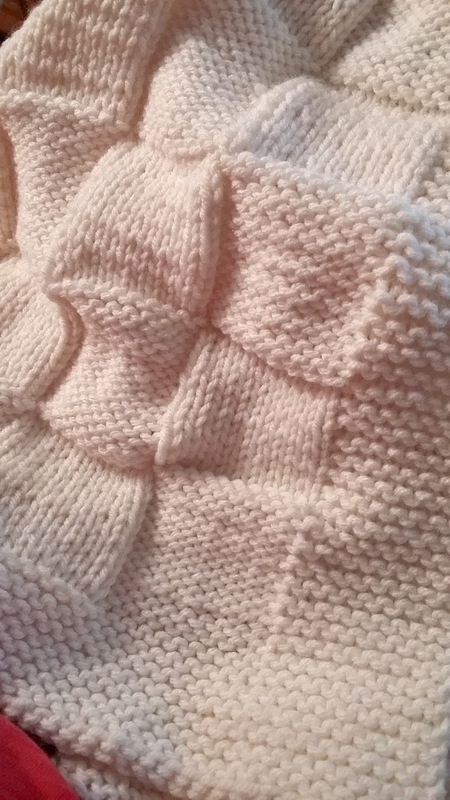 The pattern is Twisted and honestly, I probably would never have chosen to knit it based on the Ravelry photos but after seeing an example of it knit.... I Need this top. I really, really need it. 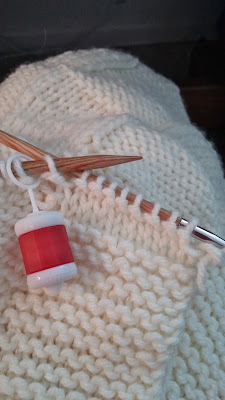 I've never enjoyed knitting with cotton or linen (which explains my lack of summer knit wear) so I decided to try knitting it with a light weight wool. Or more Pittura, to be exact. Have I mentioned how much I love Pittura? Oh. My. Gosh! It is so soft and comes in the Most wonderful colorways. Just look at those colors! If Twisted knits up okay with wool instead of linen, I'm already planning a second top. Pittura comes in a mostly green skein too. 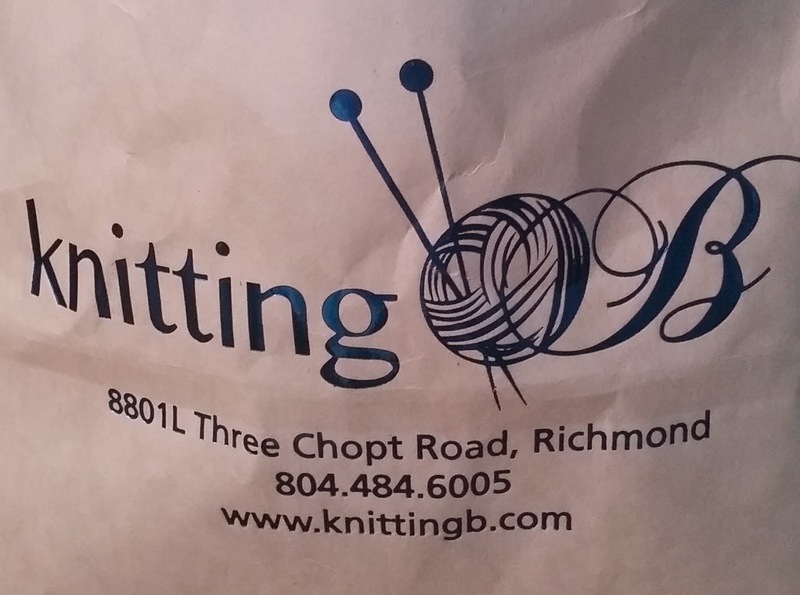 The staff at Knitting B's were all super helpful without being the least bit pushy or snobby. (Unfortunately, odd hours were not the only problem with my old LYS.) If you find yourself in Richmond, stop in for a visit. You'll probably see me there. That is, if I'm not out looking for a fifth or sixth job to pay for all the yarn I want. And I still need some gray tonal yarn for that Pi shawl. I am in so much trouble now! I'll keep today's Yarn Along post short because as bored as I am with knitting the Great White Thing, I can only imagine how bored you are of hearing about it. It feels like a never ending project but in reality, it's almost done. One more row of squares plus the border and presto-magic! It will be a finished thing. I'm fairly motivated to get this project off the needles. 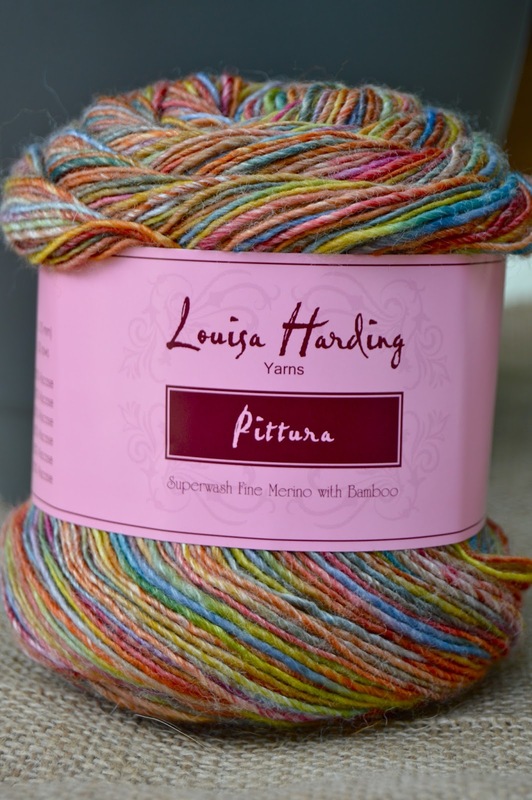 I'm jumping up and down, can't sleep at night excited to move on to knitting with the Pittura yarn I showed you the other day. I'm determined to finish the Great White Thing first. The deadline for Great White is fast approaching so I really need to stay focused. So for now.... 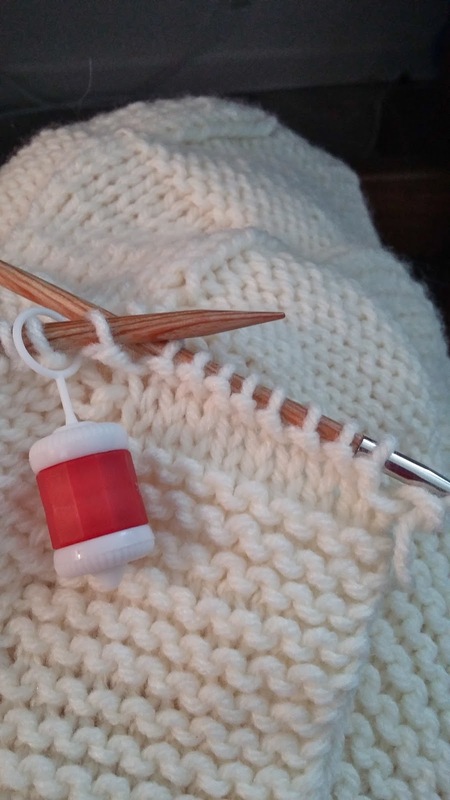 I'll keep reading Stephen King's Revival and knitting with white acrylic yarn. As for Revival, I'm 71% complete per my Kindle. I'll probably finish reading the book about the same time I finish knitting Great White. Join the fun and share what you are reading and knitting over at Ginny's Wedensday Yarn Along. Meet my new favorite yarn - Louisa Harding's Pittura. Oh my gosh! It is The softest and comes in The most beautiful color combinations. I'll tell you more about Pittura later. 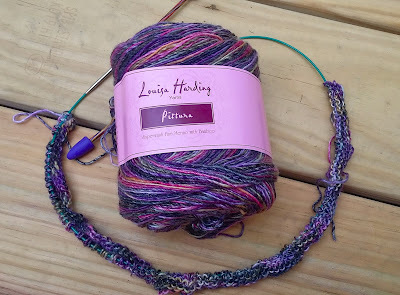 Despite how much I love this yarn, I'm too busy having a nervous breakdown to talk about it. You see, my boy child, my sweet baby boy, my little punkin boy is at the airport about to board his very first flight for his very first business trip. There's just so many things wrong with that sentence! First, how is my baby punkin boy even old enough to be going on a business trip? Isn't he still, like, twelve? Nope, he's actually 21. And he's getting on an airplane without his mamma? Lord help me & pass the valium. And yes, I'm well aware that I'm just slightly over protective of my kids. Yes, I'm aware that they are grown and are capable of doing things and going places on their own. At least in theory I'm aware. In real life.... not so much. 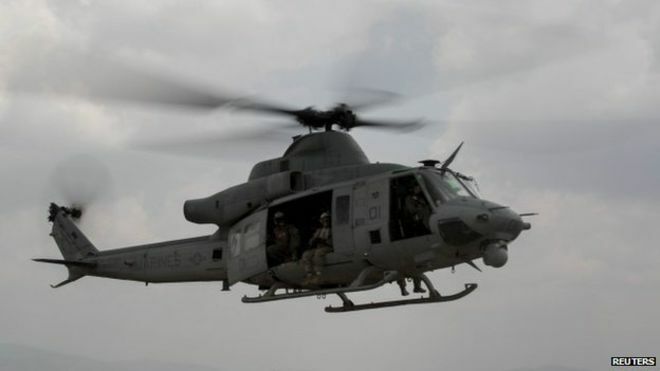 And yes, I'm a helicopter and proud of it. 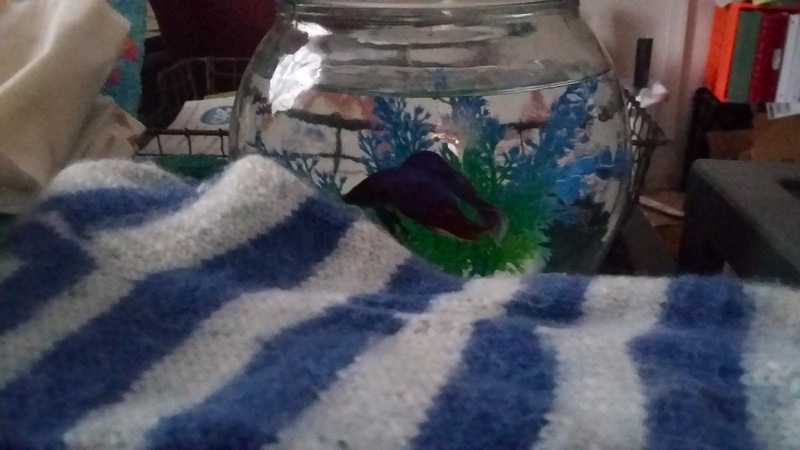 New Fish made a bubble nest. 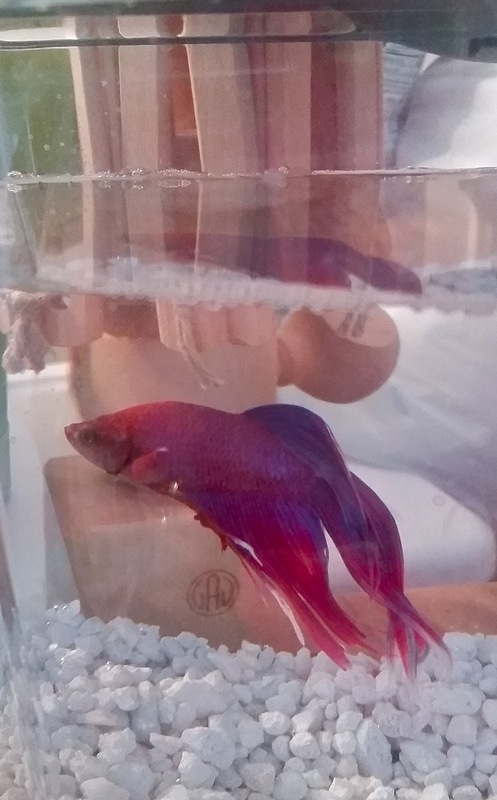 New Fish made a 'bubble nest' in his bowl. I was a little frustrated because he did it the day after I cleaned his bowl. 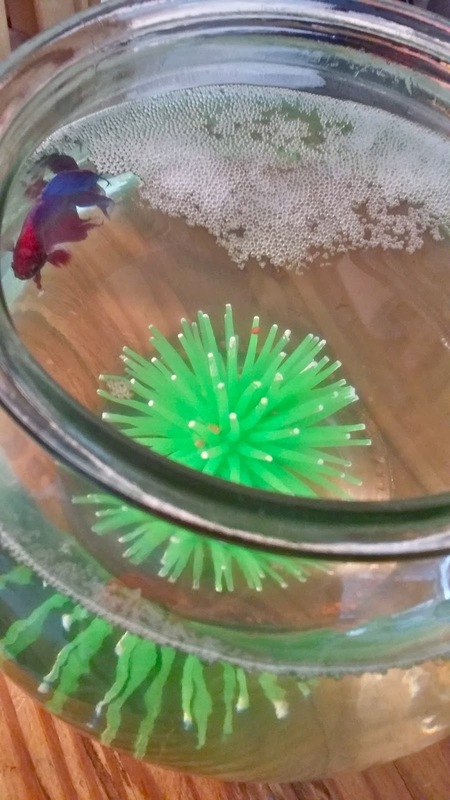 His water and bowl had been sparkly clean & clear, then suddenly, the water turned cloudy & a good portion of the surface water was covered in bubbles. Even though it looks like I need to clean his bowl again, the bubbles are a good thing. They mean he's happy. I'm happy New Fish is happy. I'd just be happier if his water was still crystal clear. And yeah, I know what you're thinking..... bubbles were the highlight of my week??? Sadly, yes. As I said, work's been busy. Our air conditioning at work caught fire a few weeks ago & it's looking like they aren't going to fix it until the off season. The other night, around midnight, it was 87 degrees in the office. That was definitely not a highlight. I donated blood but didn't pass out or even get woozy so no drama there. No drama could qualify as a highlight but it's a pretty boring one so I'm not counting it. I got a new shower curtain. But it's just plain white so I can't count that either. It's pretty pathetic that bubbles & cloudy fish water were the most exciting thing. One somewhat exciting thing is my Great White status. I'm making progress. It's looking like I will only need four or five more rows of blocks. Not rows, but rows of blocks. I'm still a ways away from the finish line, but the end is in sight. That is pretty exciting actually. Miles & miles of ecru acrylic yarn just don't thrill me so knowing I'm on the downhill side of the 'thing' makes me happy. 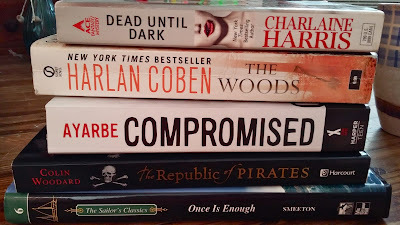 I did start reading another Stephen King novel. Even though I'm at the 48% mark according to my Kindle, I'm still not sure what the book is about. I mean, I know there's a very young boy who meets the new preacher and as the boy ages, tragedies strike.... but I haven't quite figured out what the book is actually about. It's just started to get the typical Stephen King 'woo-woo weird' vibe. I take that back. From the first few pages when the young boy meets the preacher.... I started to worry. I've been constantly on edge waiting to see what Mr. King's imagination does to the preacher. 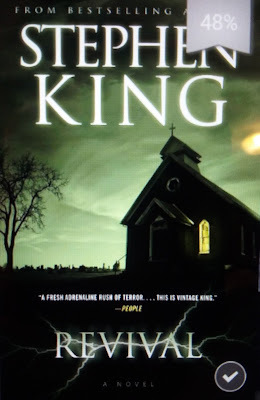 I'm assuming the preacher will turn out to be some kind of evil force simply because it's a Stephen King novel but who knows. 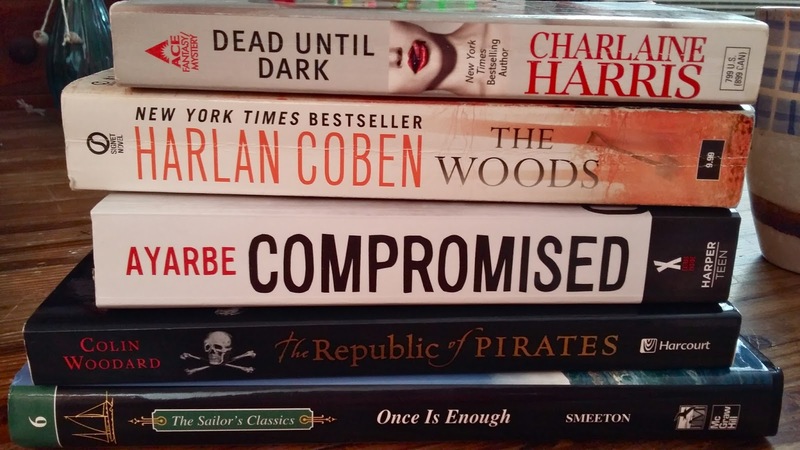 I'll just have to keep reading. 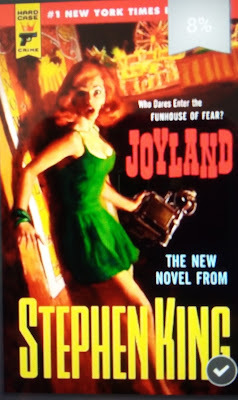 I did find it interesting that the main character worked at Joyland for a while. I love how Mr. King ties all his books together with simple mentions of places & people. 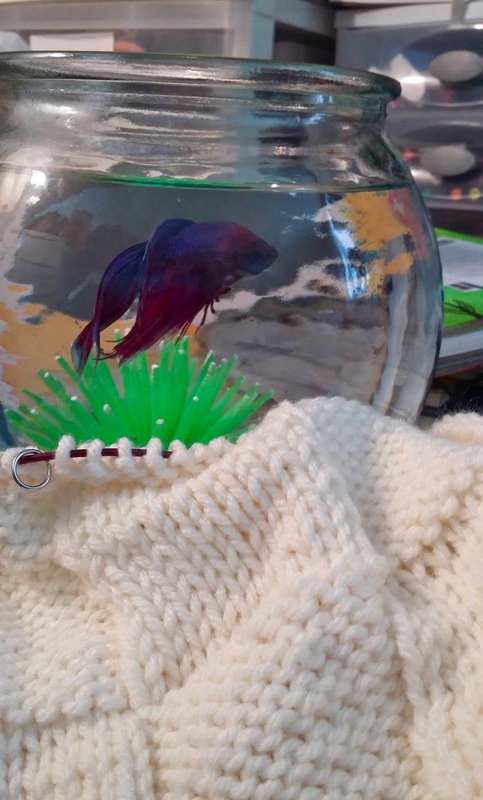 To find out what others are knitting and reading, stop by Ginny's weekly Yarn Along. 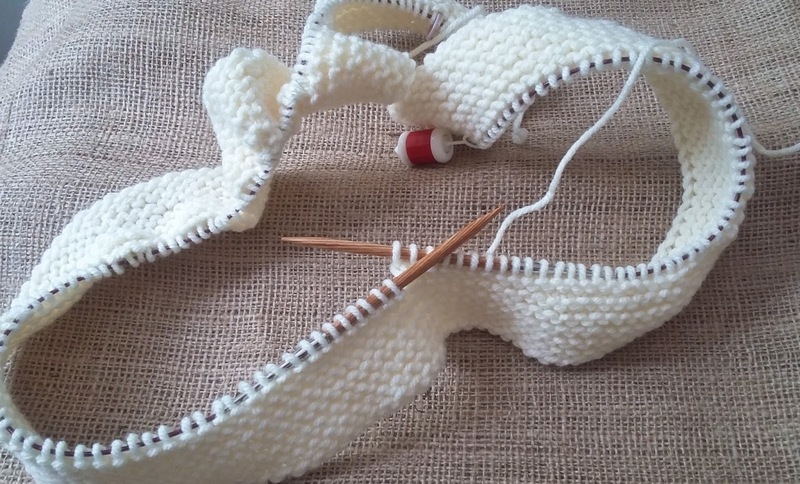 My current knitting project is a huge, giant white thing that I've been referring to as the "Great White" in my head. I actually started off referring to it as the 'huge, giant white thing' but that's just too long of a name to think about. Yarn Harlot was recently knitting a 'big white' thing and I didn't want to be accused of copying.... The idea of this giant white project, being knit from stashed, washable acrylic being a copy of Yarn Harlot's gorgeous, lacy, beaded Big White is a joke but.... Anyway, my huge, giant white thing became "Great White" in my head. And now, the Jaws tune runs through my head constantly as I knit. There are times in my life when I really, really wish my brain didn't insist on having a sound track to go with every thought I have. Anyway.... Great White is coming along. Slowly. Actually, considering my recent work schedule & my lack of enthusiasm for knitting with worsted, stash pile acrylic on larger needles.... I'm making fairly decent progress. Have you noticed I'm trying not to say what the Great White is? It's a gift so I'm doing my best not to label it but it's pretty dang obvious what it is. Or at least what it will be. What it will be if I ever have time and enthusiasm for knitting it, that is. 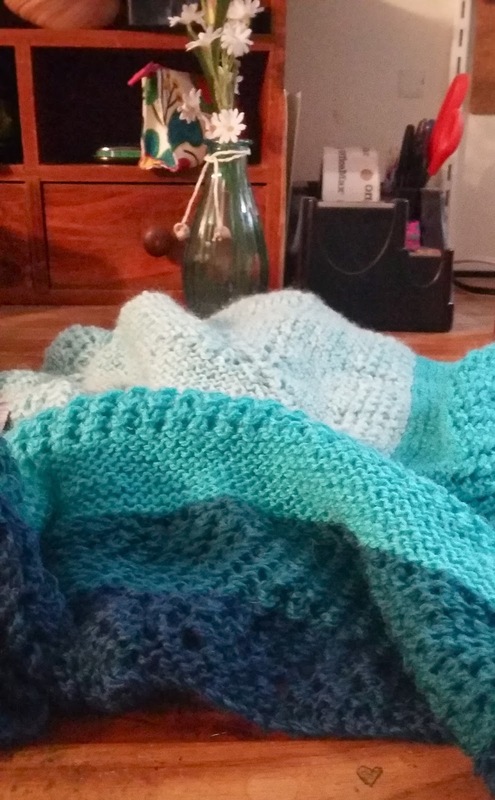 I've been binge watching Supernatural reruns while I knit Great White, which is helping. Actually, I'm not sure you can call watching 20 minutes of an episode between shifts at work 'binge watching' but it is what it is. What ever you want to call it, I'm spending my free 20 minutes a day watching Supernatural and knitting on Great White. In the show, Bobby Singer just died and I'm thinking I should probably call out from work today to stay home and comfort Sam & Dean. I think they'd appreciate it and I'm sure Great White would. I'm celebrating Independence Day a day early this year. It only took me five days to complete the bind-off on my modified Reyna shawl. I'm claiming my independence from this beast! And speaking of the beast known as work, I've got to run because as usual, I'm running late. I've started the bind-off. I'm even following the directions this time and doing a stretchy bind-off. 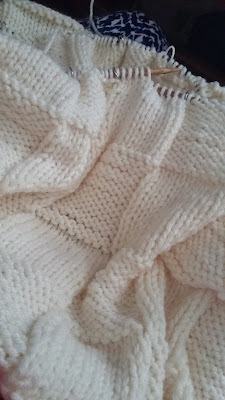 The stretchy version is making all the difference in the world but it's also a slower bind-off to execute. Since today is the first, I have high hopes of finishing it this month. Meanwhile, New Fish is hanging out, ready to help me wind yarn for the next project.